The Zambezi river starts its journey to the sea in northern Zambia, then flows through Angola, and re-enters Zambia before flowing over the Victoria Falls, through Zimbabwe and Mozambique to the Indian Ocean. It is the 4th longest river in Africa, at about 2 800 kms, It forms the border between Zambia and Zimbabwe, and is at its strongest from March to May/ June, especially if the rain gods have looked favourably on the plains of Africa. Victoria Falls and the Batoka Gorge have been formed by the force of the water rushing downstream, and the gorge at the start of the falls is over 100 metres deep, and the spray from the falls can be seen at least 1 kilometre away. It is a truly spectacular sight, and attracts many visitors each day. Posted on 4th December 2013 by newsafrica. 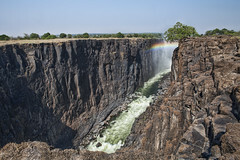 This entry was posted in Africa, Zambia, Zimbabwe and tagged Africa, Angola, Business, Indian Ocean, Mozambique, Victoria Falls, World Tourism Organization, Zambezi, Zambia, Zimbabwe. Bookmark the permalink.